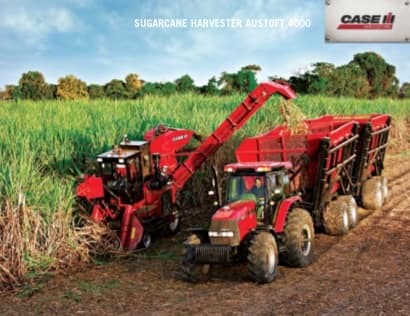 This time Case IH launches a new category in sugarcane harvesting: the Austoft 4000. It is a compact harvester designed especially to make it possible to streamline the harvesting process in sugarcane fields that use reduced row spacing from 1.0 and 1.1 meters. This line shows Case IH continued commitment to the evolution of the global sugar/alcohol sector and the goal of meeting and exceeding your expectations. 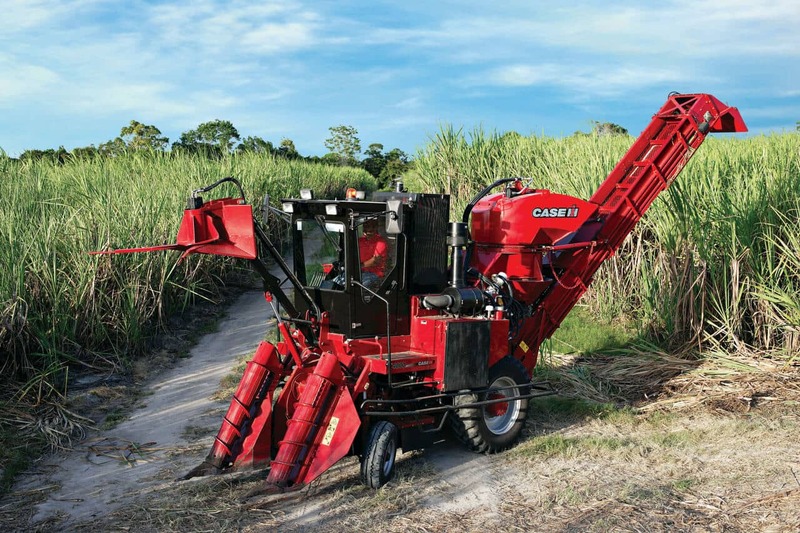 The Austoft 4000 Sugarcane Harvester represents once again the pioneering spirit of Case IH. Working in row spacings from 1.0 and 1.1 meters this harvester is narrow enough to harvest one row without compacting the root zone of the adjacent cane row. It is compact, light, has excellent maneuverability and an excellent base cut resulting in reduced cane loss and increased productivity in subsequent ratoon crops. The Austoft 4000 is designed to harvest crops up to 85 tons per hectare. Designed for maximum performance, the Austoft 4000 demonstrates its versatility by harvesting both in sugarcane fields with reduced spacings of 1.0 and 1.1 meters as well as in sugarcane fields with wider row spacings up to 1.5 meters. By harvesting in all of these row spacings, the Austoft 4000 becomes a superb option for those cane growers who need or wish to start harvesting mechanically, or for big plantation areas where the Austoft 4000 can harvest short rows and or low productivity soils, freeing the bigger volume harvesters like the Austoft 8000 series, in order to harvest to their full daily harvest capacity. This represents a significant gain in machine productivity. The Austoft 4000 is smaller in size compared to the conventional models, which makes it easier to move between cane fields. The Austoft 4000 was designed with the same functional concept as the A7000 Series harvester which means that many of its parts are interchangeable with other models of Case IH sugarcane harvesters, this feature significantly increases the machine’s cost-benefit and provides you more value for your dollar. The Austoft 4000 was designed to make maintenance simple. The engine, hydraulic system, and industrial components are easily accessible, streamlining the machine preventive maintenance, to increase the machine’s availability to you. The Austoft 4000 is designed around the operators needs for greater productivity. The controls are ergonomically positioned to ensure convenience, comfort and functionality for the operator during the long working hours. Large windows and four rearview mirrors provide 360-degree visibility from the cab. Lights mounted on the rear of the cab roof illuminate the elevator and haul-out bin. - Well-lit controls and monitors are easy to read.